A powerful integrated solution addressing all phases of a bank's enterprise financial crime prevention program. 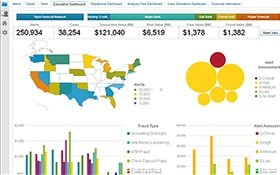 IBM Counter Fraud on Cloud uses behavioral modeling and analytics to detect suspicious patterns and claims, reducing medical and financial fraud and waste. IBM Safer Payments provides real-time fraud prevention in any cashless payment system, through any channel.